I received some very interesting feedback of a reader concerning the previously discussed Lwena staff from the last Native auction. While proofreading the manuscript of Africa at the Tropenmuseum (2011), Gerard van den Heuvel discovered a staff from Angola in the museum’s collection (Tropenmuseum inventory number 5144-10) attributed to the Lovale – illustrated below. 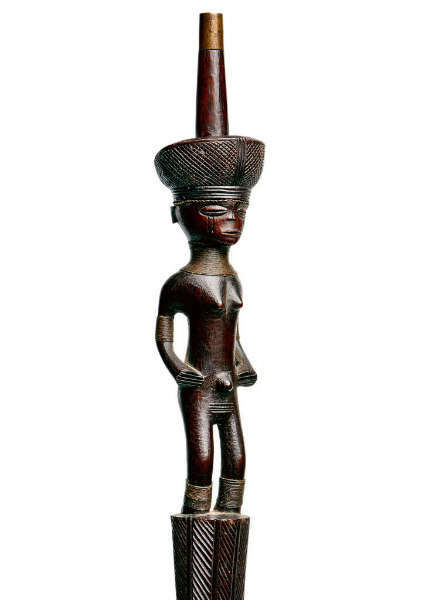 The staff is 100% Chokwe as the top figure represents the Chihongo mask character and one that is exclusive to Chokwe. Luvale/Lwena do not have the character. Chihongo masks are normally associated with the courts of chiefs and the maternities generally refer to the chief’s lineage or bloodline, therefore inheritance of the tile. The female figures are “mother and child” or maternity figures (not pregnant at this point but mothers with babies). 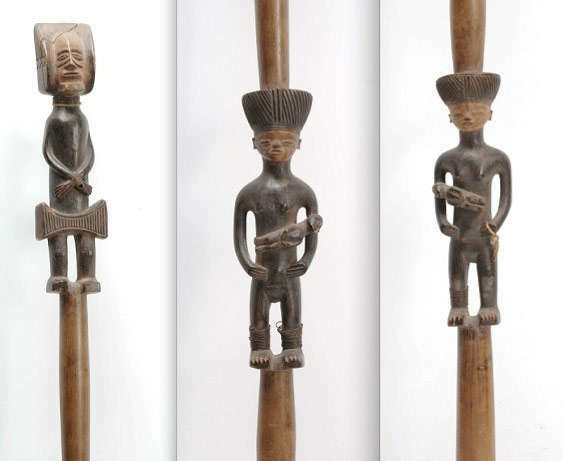 More specifically, I can identify this staff as either made by the hand of a Chokwe carver named Itangui Itangui or by somebody working with him/or his workshop. I have been researching Chokwe carvers (some randomly documented) and I can readily associate this one with Itangui. There are few references about him on Portuguese books in relation to specific type works. In short he is a carver that Portuguese ethnographer, Jose Redinha, met in the 1930s (my calculations) and one he considered a “master carver”, particularly known for maternity figures. This is tricky as not everything he made is a masterpiece but in my opinion your staff is made for local consumption and used in ceremonial contexts and not a piece made for export or Europeans. A number of pieces from Itangui Itangui have come up at auction in the past several years, almost always erroneously identified as Lwena because people assume the hairstyle or coiffure departs from Chokwe. Previously identified as “The Lwena master of the center parting coiffure”, I am extremely pleased we now know the name of this talented artist. Many thanks to Gerard van den Heuvel for the much appreciated feedback. Below a maternity figure by Itangui Itangui from the Dondo Museum. Collection Museu do Dundo (G 289; 1939). Published in: Bastin (Marie-Louise), “La Sculpture Tshokwe”, Meudon: Alain et Francoise Chaffin, 1982:171, #104. This entry was posted in Research and tagged Chokwe, Lwena on July 17, 2013 by admin. 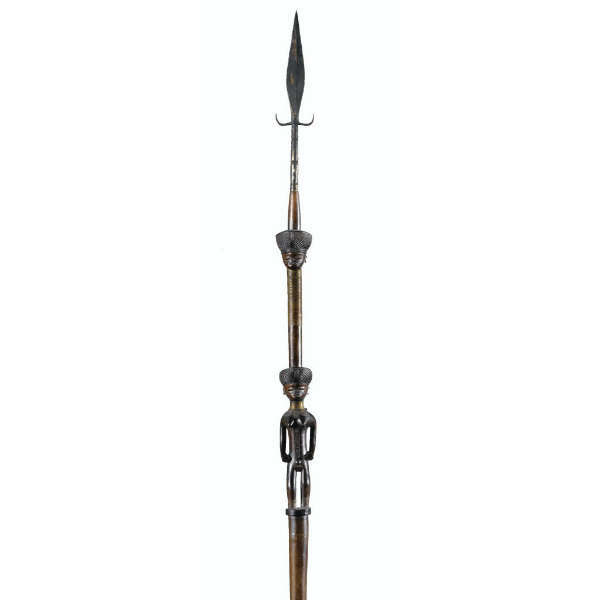 Another interesting find in the next Native auction in Brussels: a beautiful Lwena staff from Angola. Such staffs were associated with the power and authority vested in chiefs. Staffs like this one are said to have represented female ancestors whose status as fulfilled women was signaled by, on the one hand, their elaborate coiffures, and, on the other, their body scarifications. Scarifications identified mature women as having undergone various forms of female initiation. which is most likely from the same hand. Three other staffs from this artist are known: one in a Belgian private collection (YVRA 0026700), one in a British private collection (YVRA 0097335) and a last in the Terence J. Pethica collection (UK), published in The Art of Southern Africa. The Terence Pethica Collection (p. 85, #29). More research will probably reveal additional works from this master carver, which we for now will call “The Lwena master of the center parting coiffure”. UPDATE: the research on this artist continues here: A Chokwe carver named Itangui Itangui. This entry was posted in Auctions, Discoveries, Objects and tagged Lwena on May 24, 2013 by admin.